Mario Bitali said it best, “In life there are two kinds of people, Italians and those who want to be Italian.” I consider myself lucky to be a descendant of the wonderful country of Italy. Although I didn’t inherit a thick luscious head of brunette hair or a beautiful olive complexion, I was blessed with the greatest aspect of being Italian- having Italian Grandparents. Italian Grandparents are not ordinary grandparents. My Italian Grandparents have enriched my life in so many ways. They instilled in me an appreciation for food, family, and togetherness. They taught me what it is to work hard. They showed me how to love and enjoy life. My Italian Grandparents acquainted me with the kitchen. From them I learned how to make meatballs and a pot of sauce… and pasta fagioli… and manicotti… and cannolis… and lasagna… and eggplant parmigiana… and chicken cacciatore… and pizzelles… and cavatelli & brocolli… and antipasto… and escarole soup…. and Italian S cookies…… And all the while, I learned that these dishes must be pronounced the correct way, the Italian way. They made me realize that a meal isn’t just about eating, it’s about gathering around a table. My Italian Grandparents taught me that the best part of a glass of wine is the first sip and the last sip. They showed me that basil can easily be grown in a living room and that it does not have to be limited to plant-size. My Italian Grandparents have a basil bush. They introduced me to the concept that parmesan cheese should only exist in mass quantities. Garlic, too. They remind me that the most sincere way to greet someone is a firm pinch and kiss on the cheek. My Italian Grandparents made me a firm believer that breakfast is the most important meal of the day. So is lunch, and dinner, and dessert, and all of the other meals in between, for that matter. From my Italian Grandparents, I developed keen skills for grocery shopping (By the way, tomatoes are on sale at Shoprite this week for 99¢/lb…. just sayin’) They taught me the meanings of many Italian words, most of which are followed by an exclamation point. For instance, Mangia! Salut! and Aspetta! And last but not least, they proved to me that with age comes wisdom. This recipe is dedicated to my Italian Grandfather, Angelo Pennella, on his 80th Birthday today!! He is not only the greatest Italian I know but one of the greatest people in the world I know. Happy Birthday, Pop!! Bake 24 cupcakes according to package directions. Let cool. Scoop out centers of cupcakes with a spoon to make little pockets in the top, to be filled. Use cheesecloth to strain excess water from ricotta cheese. I wrap the ricotta in the cheesecloth so it is a ball shape, then use the excess cloth to hang it from the bottom of one of my upper kitchen cabinets (2-3 hours.) Put a small bowl underneath to catch the drippings. Once moisture is removed, mix the ricotta with the sugar and almond extract. Put this mixture in a piping bag (or large ziplock bag, cutting off bottom corner) and fill pockets of cupcakes leaving a large swirl of filling on the top of each cupcake. 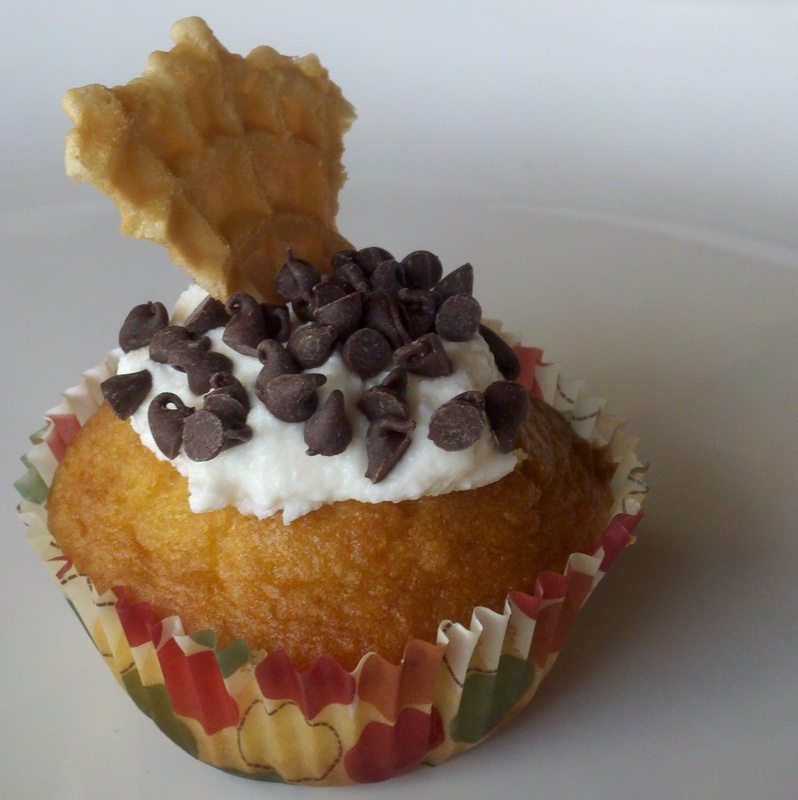 Sprinkle on mini chocolate chips and decorate with a piece of cannoli shell.